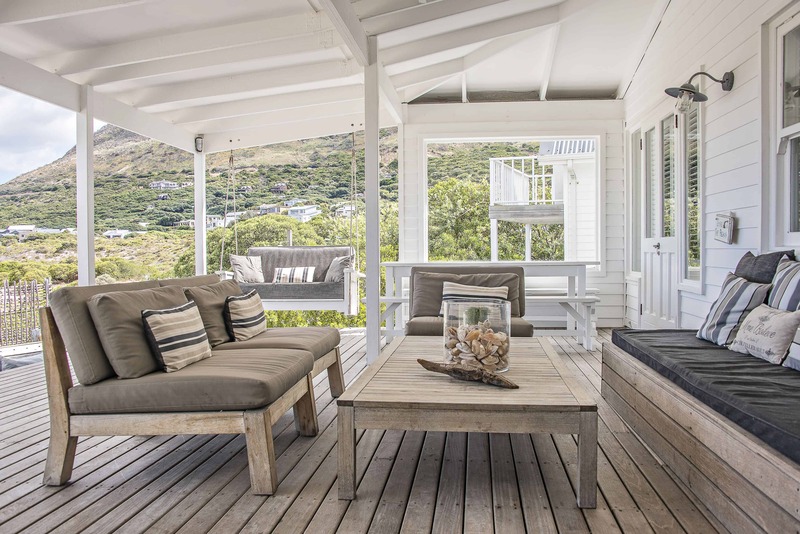 The patio tends to be one of the most used areas of a home during the warmer weathers. 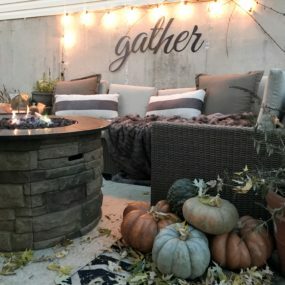 Therefore, it only makes sense to create a personalized space that will bring together your outdoor décor and perfectly pair it with your indoor aesthetics. The following patio ideas will perfectly elevate you’re your outdoor area, giving you the perfect backyard. Use weather wood furniture for the tropical almost resort type of feel to your patio. Keep the colors neutral for the ultimate vacation like space. Use a few chairs and cushions for the ultimate put together space. Consider adding pattern cushions to bring color that will bring the area back to life. 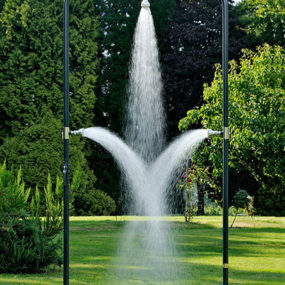 Do not limit yourself, when it comes to your outdoor patio decor. Look out for weathered wood for that natural feel that is still edgy and fun. Not only will it appear put together, but it will stand against the elements that the area will have to endure. If you can’t find weathered wood, consider faux wood that is actually made out of metal. The aesthetics will look the same but will not ruin with the weather. 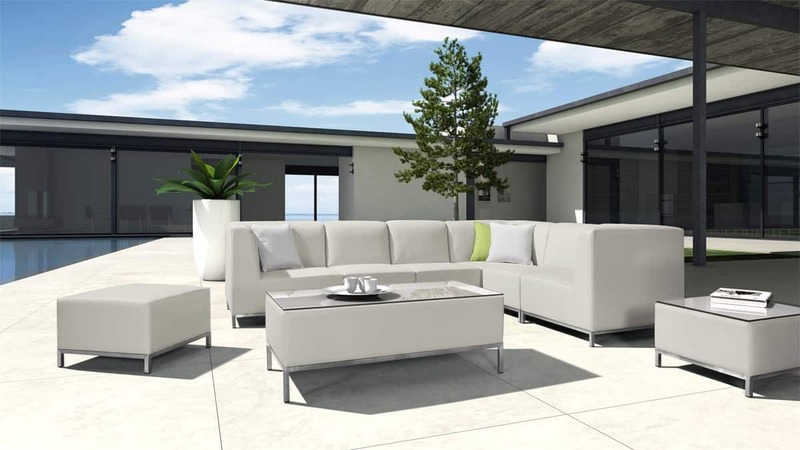 Its modern, trendy, and contemporary to have an elegant sofa in the outdoor space. The idea is to bring your indoor decor to your patio to help create that seamless feel between your indoor living room and your outdoor patio. Allow both spaces to come together. 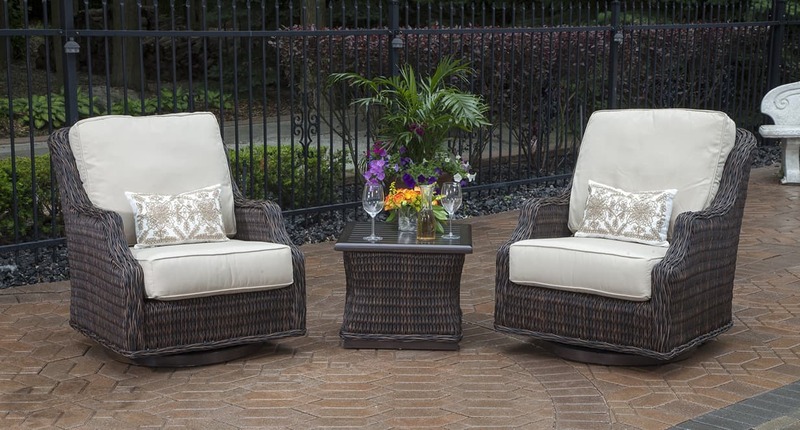 Comfort is key when you want to work your patio décor. Consider using an outdoor sofa and/or accent chairs to complete the look. You may even want to add a rug to allow your living room to flow into your patio area. Doing so will create a double dimensional area. 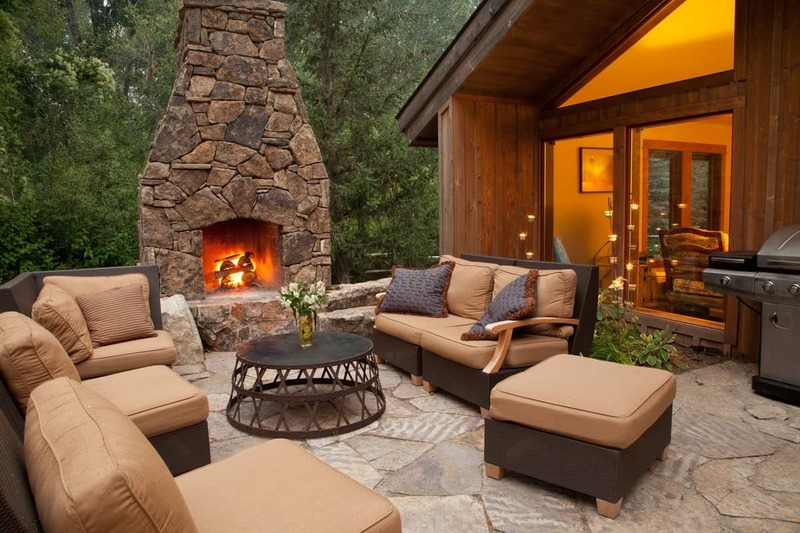 An outdoor fireplace is the perfect touch to any decor you may already have going on. It will give your decor a touch of elegance while still being put together. Keep the decor simple to allow your fireplace to make the big splash you want it to make. 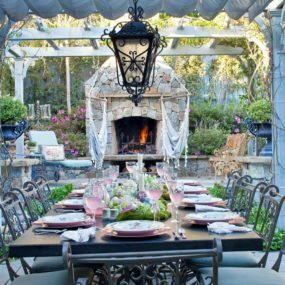 The fireplace does not need to remain indoors, you can actually have a lavish outdoor fireplace with little to no effort. The key is knowing your space and how big of a fireplace you can have. 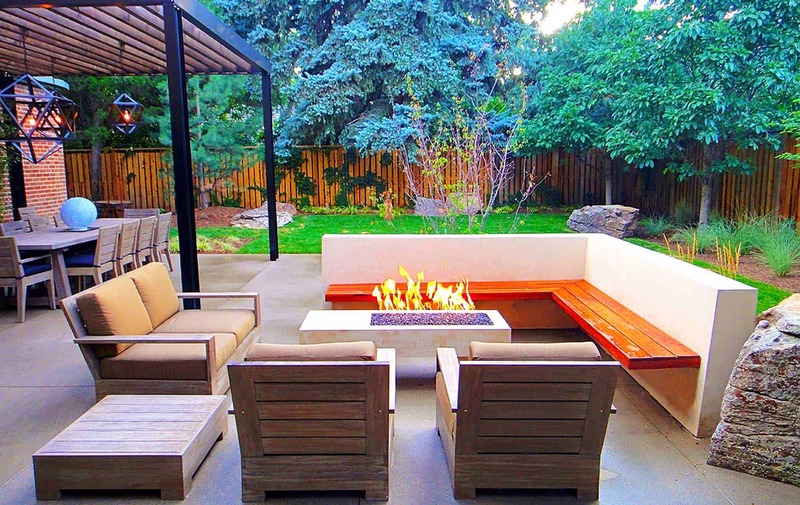 The bigger your patio is the larger and more-grand your fireplace can be. If you have a smaller area, consider having a bowl-like fireplace that adds the warmth you seek without taking space. 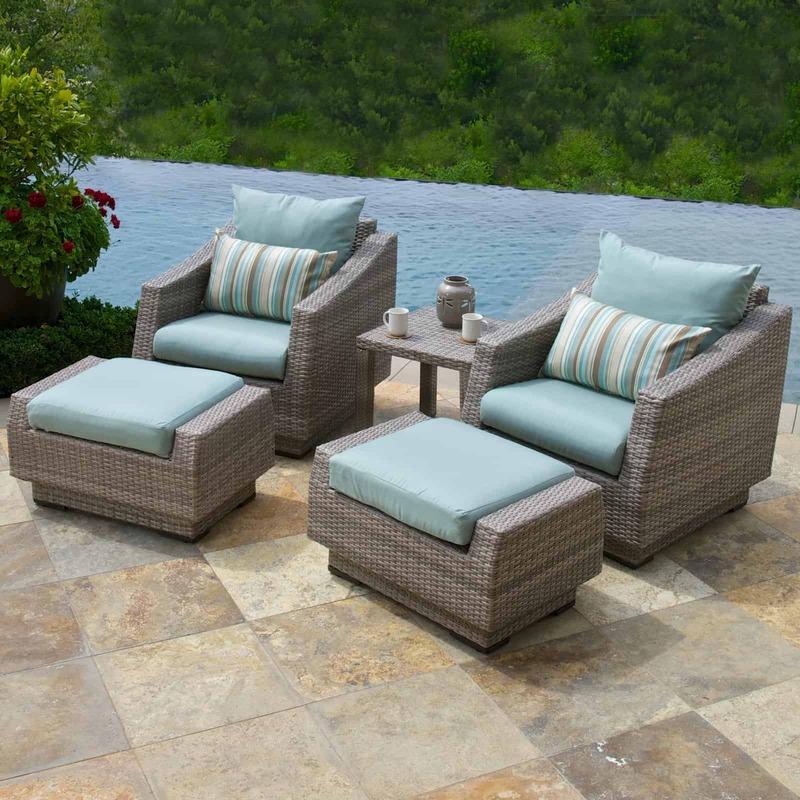 If you have a smaller patio area consider having wicker chairs and accent table instead of a full patio set. Doing so will allow you to make the most of the area while still having that touch of outdoor pieces. Use cushions in multiple different hues for a touch of color that makes sense. 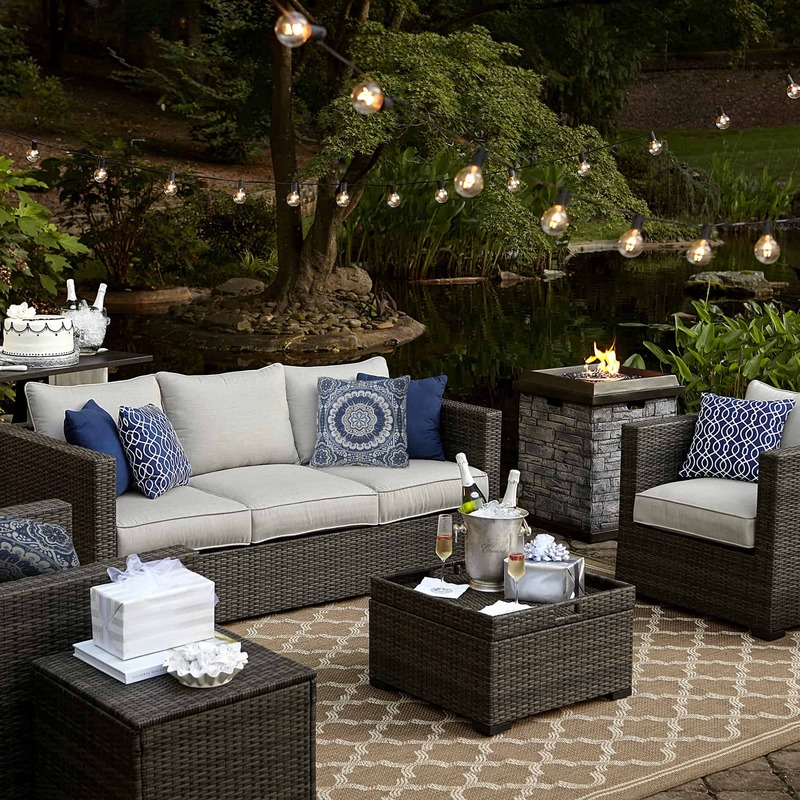 Wicker is an excellent furniture material for the outdoor patio area because of how well it appears and how well it will withstand the weather. If you aren’t a fan of using wicker, contemplate having at least one or two wicker chairs for that traditional appeal. A pop of color is an excellent way of bringing spring and summer vibes to the patio space while still being simple and put together. Add brighter hues that pair well together such as yellow, orange, blue, and pink and pair them with neutral hues to allow them to make the staple they were meant to create. 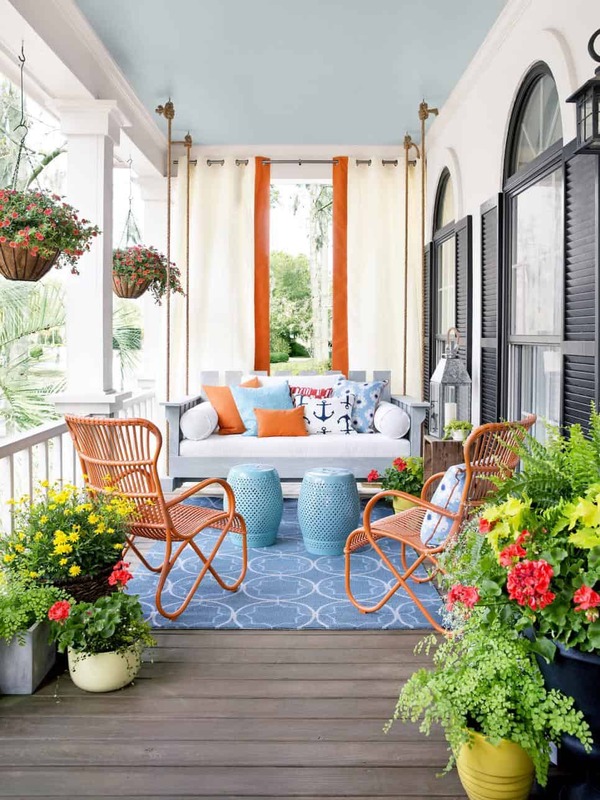 We love the idea of having pops of color anywhere in the home, the patio is no exception. 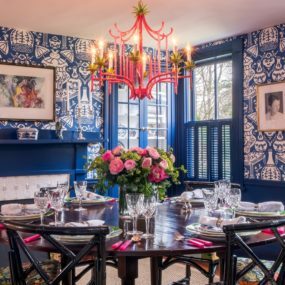 Adding pops of color into your décor could be exactly what the space needs to come full circle and feel comfortable yet trendy. 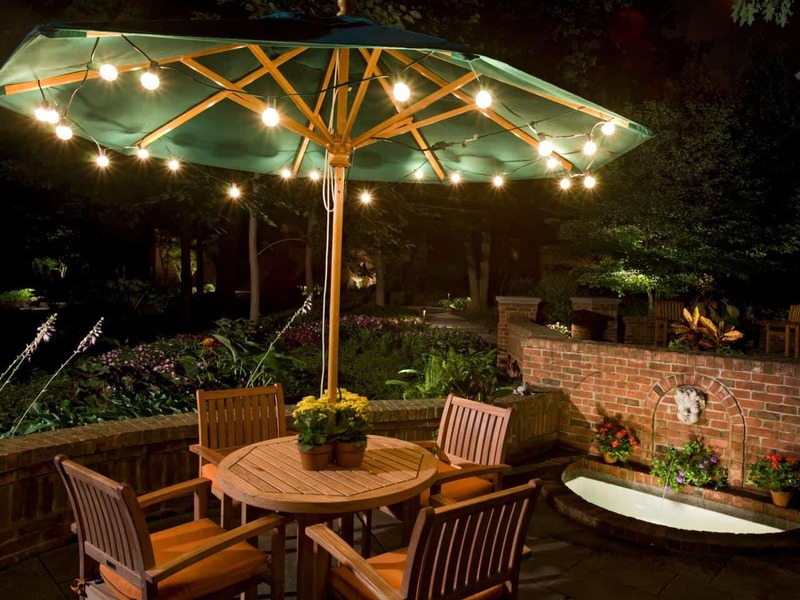 Lighting is very important in any area but this is especially true for the outdoor area. 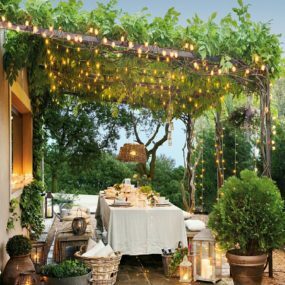 Even if you think you will not be using your patio at night, having a few light fixtures can make all the difference in the world. You will be able to use your patio at any time and it will be lit enough for you to be able to do so. Whether you are using your backyard patio during the day or the evenings there’s a large possibility you will need lighting. Good lighting doesn’t just come in handy when you are using the space, but it will come in handy for décor purposes. Add different light fixtures that brighten the space yet bring a warmth almost inviting feel to the area. If you feel like you need a contemporary piece in your patio you may want to add a bench. Adding in a bench will bring that hint of contemporary while still being easy to have and incorporate into your decor. Pair with a few chairs to bring the entire look together. If you have a large family or simply enjoy entertaining, often having a large seating bench is one idea you can’t pass up. The large seating area will allow you to have enough room for everyone while having a statement piece that enhances the space. Add colorful cushions or patterned ones of a trendy element. A patio bar is perfect for entertaining while still being outside of your home. The key is having a bar that has everything you need while still allowing you enough space that your patio doesn’t appear overcrowded. Use vivid bar stools for an easy pop of color. If you have the advantage of having a larger patio and don’t know how to cover as much foot space as possible you may want to consider adding a mini bar. Outdoor bars have become all the rave due to their ability to transform an outdoor space into an entertainment area. Incorporate a mini bar to bring a “party bar” that works for you and your guests. 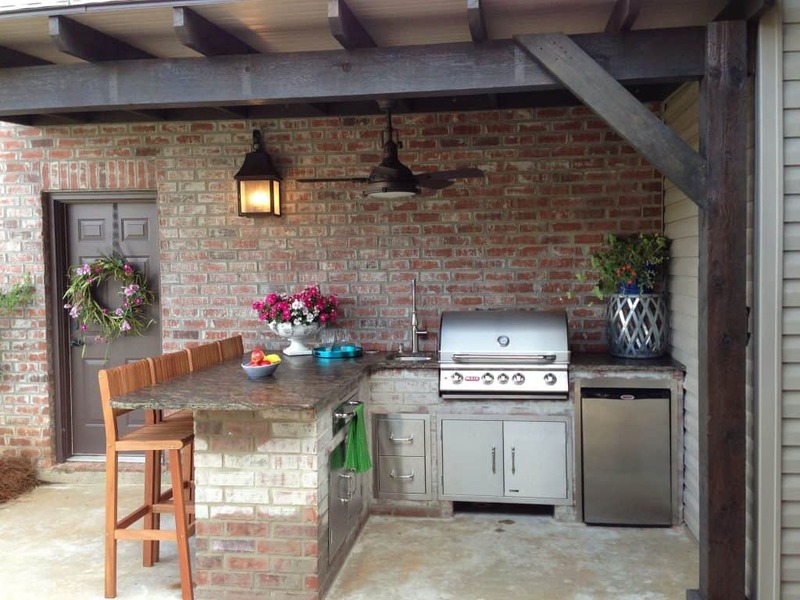 Your outdoor kitchen can be exactly what you have always dreamed of. 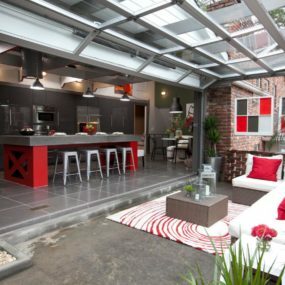 The idea is to have your necessary elements outdoors to allow your patio to feel as an extension of your indoor kitchen. Doing so will have your outdoor area be used and loved more often. Just like a mini bar will allow entertainment to become easier due to it being closer, having a patio kitchen will do the same. Why keep your kitchen indoors only when you can have one outdoors as well. 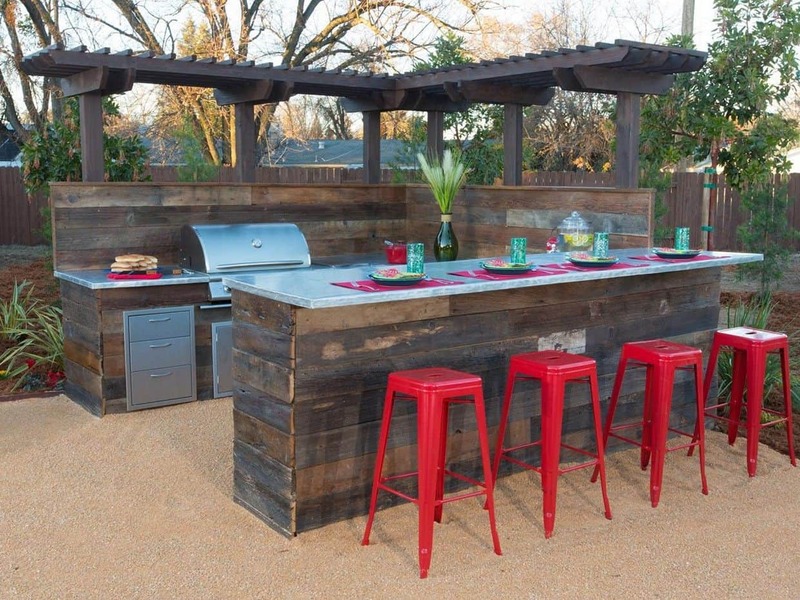 When shopping for outdoor kitchen appliances ensure to purchase steel pieces that will withstand the weather. 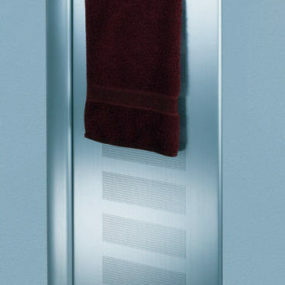 Additionally, consider covering your appliances when not in use to keep them fresh all year round. 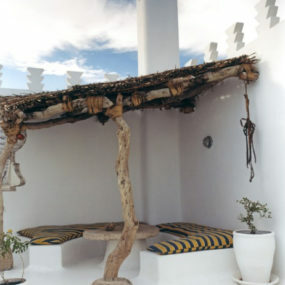 Elegant furniture doesn’t only need to remain indoors, it can also become part of your outdoor decorative scheme. Consider having a colorful addition such as cushions in bright colors or patterns that bring the space together. Keep it elegant and keep it sweet with a stylish table that adds that hint of chic in any size space. Pair with a few fun seats for a tasteful touch that will bring that hint of modern to the space that may be needed. Keeping it simple is one of the best ways to have your patio area become one of your favorite spaces in the home. The key is having the simple furniture have texture or color. Doing so will allow the pieces to stand out while not taking up much space. Even though lavish and chic are always a good idea, sometimes a space is in simple need of nothing but a touch of simple. 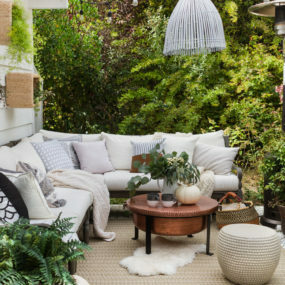 Keep the décor minimal and sweet to not only make the space feel larger but to bring that classic element to the patio space. The beauty of having contemporary pieces is there ability to seamlessly have a cool vibe that is easy to work around while still being bold and making statement. We love the idea of white furniture with bold hues as accent shades. Use an accent table to bring everything together. We love contemporary décor because of how personal it is for the homeowner. The ability to have a personalized space that is still trendy tends to be one of the best ways to bring that hint of character without adding or removing too many elements. Which of these ideas will you be incorporating into your décor? Please share with us in the comments below.